To mark International Women's Day, Palestinian Authority TV broadcast an interview with the director of the Palestinian Women's Union in Gaza, Amal Hamad. "We have had female martyrs, wounded and prisoners. ... The women were the first to take part in the battle. 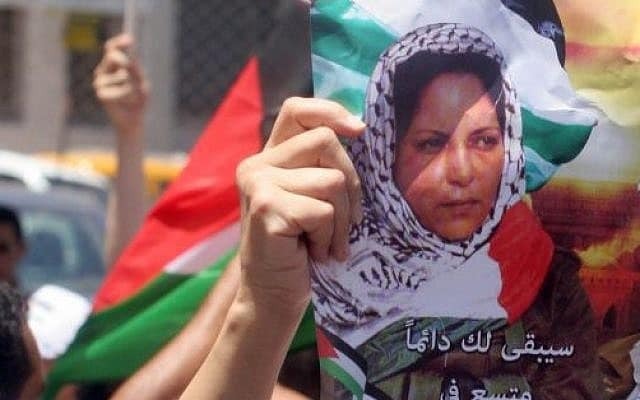 That is why we also have female martyrs--Shadia Abu Ghazaleh (i.e., terrorist, prepared bombs for terror attacks), Dalal Mughrabi (i.e., terrorist who led murder of 37, 12 of them children), Wafa Idris (i.e., first female suicide bomber, murdered one), Ayyat Al-Akhras (i.e., youngest female suicide-bomber, murdered two), Darin Abu Aisheh (i.e., female suicide bomber, wounded three) ... "
Indeed, the female Palestinian murderers do enjoy a special position in Palestinian society. Terrorists Shadia Abu Ghazaleh and Dalal Mughrabi both have P.A. schools named after them. All the terrorist murderers she mentioned are the focus of constant attention and glorification. Official P.A. TV reporter: "To those who use beatings and violence to solve their marital problems: Carefully read the Koranic verse again [Sura 4:34]. There are solutions before giving beatings. If you have to, there are religious rules for beatings that must be obeyed. Guys, the goal of the beatings is rebuke in a way that does not cause injury. You can even go ask someone about it." Although the reporter did remind viewers that "there are solutions before giving beatings," she didn't categorically reject violence against women. That this green light for violence was given in earnest is clear from other similar instructions disseminated by religious authorities on P.A. TV that Palestinian Media Watch has exposed. The glorification of female murderers on International Women's Day is easier than addressing the specifics of Shari'a law. "First, he needs to rebuke her and quote the Koran and hadith on the ban on lying. If that does not work, he need to forsake her in bed. ... The [Muslim] scholars said that the beating can be with a small brush or a handkerchief, and the number of blows should not exceed 10."